Browse Zoho Flow's pricing page or plan comparison page for everything you need to know about Flow pricing and plans. You can have 5, 20, or 50 live flows depending on the plan your Zoho Flow organization is subscribed to. Certain steps of your workflow, trigger, decision, and set variable, are not counted as tasks. Every other action (app or logic-based) your flow performs is counted as a task. Let's take a look at how task consumption is calculated with an example. 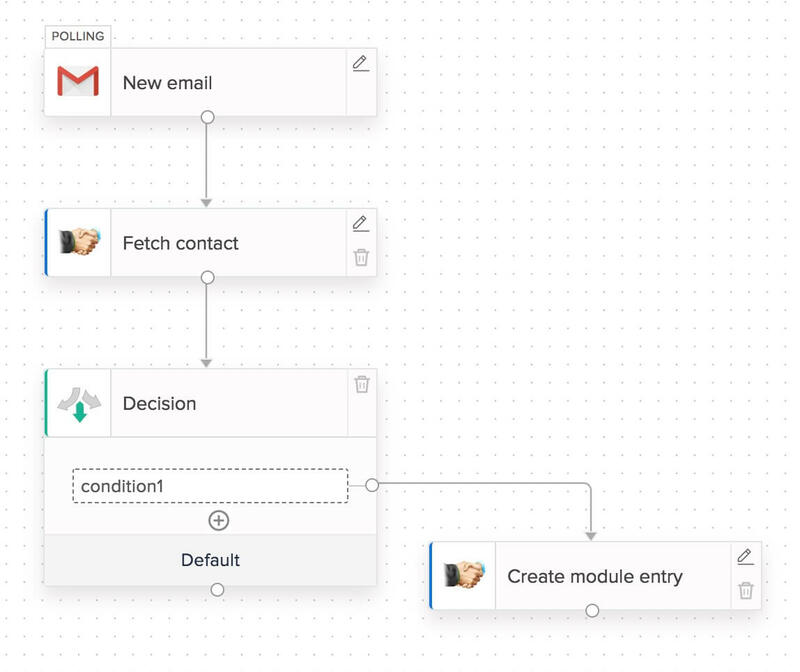 When a new email is received, this flow fetches the contact in your CRM to check if the contact exists. If the contact doesn't exist, the flow creates a new contact. Otherwise, it does nothing. This flow consumes two tasks per execution if it takes this branch. For 100 successful executions, this flow branch uses 200 tasks. Note: In certain fetch actions, you can choose to create the record if it doesn't exist. If the flow only fetches (record is already available), it will be counted as one task. In cases where the flow creates the record (record is not available during fetch), it will be counted as two tasks. In this case, the flow takes the default branch after a decision and stops. This flow consumes one task per execution in this branch. For 100 successful executions, this flow branch uses 100 tasks. An action in your flow will be counted as a task only after it has been executed successfully. Actions that have failed will not be counted as tasks during that particular execution. Every month, your organization will be credited with a number of tasks depending on your plan. Note that if you are on the yearly plan, your tasks will be credited monthly, rather than all at once. Your task count will be reset monthly, which means that tasks left over from one month cannot be carried over to the next month. For example, if you're on Flow's yearly Standard plan, you have 12000 tasks per year. This means every month your organization will be credited with 1000 tasks. Let's say you subscribed to Zoho Flow on 15th July and were credited with 1000 tasks. On 15th August, your task count will be reset to 1000 again. Any tasks left over from the period of 15th July - 14th August will not be carried over. You can check the remaining tasks by clicking the profile icon in the top-right corner of your Zoho Flow organization. If you've exhausted the tasks for the month, you can browse Zoho Flow's pricing page for add-ons. These are extra tasks you can purchase monthly to ensure that flows don't stop running. For any questions related to pricing and subscription, drop us an email at support@zohoflow.com.